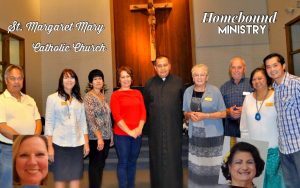 The Homebound Ministry provides a connection for the homebound via parishioners visiting and bringing Holy Communion to those unable to come to mass. Our ministry offers kindness and spiritual support, helping the homebound to remain a part of our faith community. 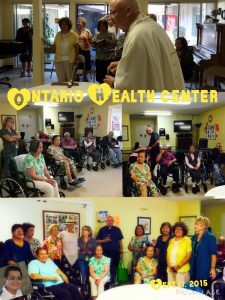 We send forth Eucharistic Ministers to hospitals, nursing homes, assisted living facilities and private residences to provide comfort, prayer, a patient ear, and most importantly Holy Communion. Our Homebound Ministry welcomes parishioners to join us in reaching out to our extended church community and offers training to help you get started in this rewarding service.